Recently departed White House strategist Steve Bannon is preparing a war for Donald Trump, not against him. 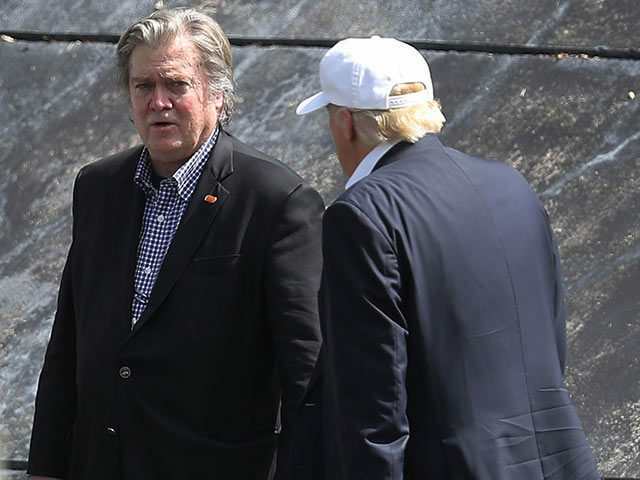 “If there’s any confusion out there, let me clear it up: I’m leaving the White House and going to war for Trump against his opponents — on Capitol Hill, in the media, and in corporate America,” Bannon told Bloomberg Businessweek’s Joshua Green. Green said that Bannon “sounded like he’d just consumed 40 Red Bulls” during his conversation with him on the phone. Bannon did not specifically mention the White House “Democrats” advising Trump in his conversation with Green, widely considered to be his enemies during his period of service. In an interview with the American Prospect published on Wednesday, Bannon said his enemies were “wetting themselves” about his agenda. He specifically criticized White House economic adviser Gary Cohn and “Goldman Sachs lobbying” in the White House.